Chi Chi the Panda is a mascot for Chi Wellness Clinic. We hope to convey our passion to care for patients and our commitment to enhance their precious well-being. 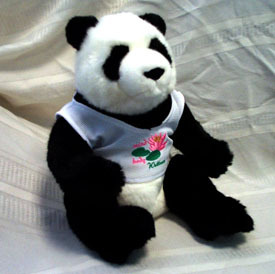 In 2005, Chi Chi the Panda who wears a T-shirt with a lotus flower, was christened as our mascot. 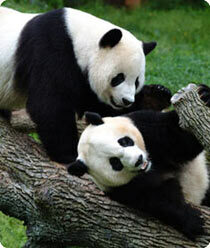 The scientific name of the giant panda is Ailuropoda melanoleuca. It means simply "panda footed black and white creature". Some scientists suggest a small bear like animal, Agriarctos, that lived in the mid Miocene (about 3 million years ago), is an ancestor of the giant panda. The fossils of the present day giant panda can be found from the Early Pleistocene. There may have been as many as 4 species of Ailuropoda. The distribution of giant pandas was much more extensive in the Pleistocene. The giant panda is called Xiong Mao in China today, meaning bear-like cat. During the Western Chou dynasty (over 3000 yrs ago), it was called Pi. In ancient China the giant panda was considered rare as well as a symbol of might and bravery. When the Empress Dowager Bo's (179-163 BC) tomb was opened 2100 yrs after her death, a giant panda skull was found at her side. A historian noted that in the Western Han Dynasty (206 BC - 24 AD) the emperor had a garden of rare species; the giant panda was his most treasured animal. The giant panda was not known outside of China until a French missionary and naturalist, Pere Armand David, was brought a dead specimen by hunters on March 23 1869. In 1870, Alphonse Milne-Edwards received Pere David��s specimen. Upon dissecting it, he placed the giant panda in a new genus, Ailuropoda melanoleuca. He later renamed the giant panda Ailuropus (panda-like). In 1914, the first westerner to see a live panda was a German zoologist, Hugo Weigold. This set off a string of western hunters seeking a giant panda pelt. Among the first western hunters to kill a giant panda were Kermit and Theodore Roosevelt in 1928. They were the sons of President Theodore Roosevelt. On April 24 1939, China issued an order that prohibited the capture of giant pandas. Ruth Harkness was the first person to introduce a live panda cub (Su ling) to the west. Her adventure can be read in her book "The Lady and the Panda." The panda cub was brought to the Brookfield Zoo in Chicago in 1936. Three other pandas were captured and taken to the U.S in the 1930's, Mei Mei, Pandora, and Pan. Pao Pei was the last panda that was captured and exported by a western nation. Chi-Chi the Panda arrived at the London Zoo in 1961. In 1972, when China was recognized by the U.S., two pandas were sent as a gift to the U.S. (Hsing Hsing and Ling Ling) at the National Zoo in Washington D.C. When the World Wildlife Foundation (WWF) was formed in 1961, the WWF adopted the panda as its logo. The black and white panda has since become a symbol for the conservation movement as a whole. Tai Shan (tie-SHON) was born early in the morning on July 9, 2005 at the National Zoo. At Tai Shan's first exam on August 2, we learned that the cub was a boy. He was the first baby of Mei Xiang and Tian Tian (see below). He weighed 1.82 pounds and had a total body length of 12 inches. On January 8, he weighed 28 pounds and was 37 inches long��quite a rapid growth rate. More than 200,000 votes were cast to name the cub in China. The winning name, Tai Shan ("peaceful mountain"), was given to the cub when he was 100 days old, on October 17. Tai Shan's parents are the National Zoo's second pair of giant pandas from China. The mom is Mei Xiang (may-SHONG, 235 lb, born on July 22, 1998), and the dad is Tian Tian (t-YEN t-YEN, 275 lb, born on 8/27/97). Both were born at the Wolong Panda Base (see below). It is hard to tell giant pandas apart, but Mei Xiang and Tian Tian	do have different markings. Mei Xiang has a pale black bar across the bridge of her nose. 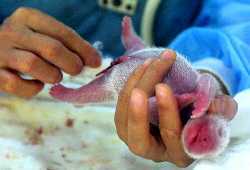 A one day old baby (Xiao Jiao) weighs 6.4 ounces and is the fifth panda to be born at the Chengdu Panda Breeding Research Base in September 6, 2002. Twelve pandas were born in China during 2002. 110 pandas live in captivity throughout the world and less than 1000 live in the wild. Chinese scientists are trying to use cloning technology to help save these highly endangered animals. A baby panda cuddles with its mommy at the Wolong Panda Research Center in Sichuan, China in September 7, 2001. A panda pregnancy can last 70-180 days. The destruction of their environment, hunting by humans, and their low birth rate make things look bleak for the future of pandas. A baby panda receives gentle care a	the Wolong Nature Reserve Panda Base in China. The Chinese government has made tremendous efforts to save the pandas from extinction. Click to hear the sound of a giant panda.